Not so long ago I stumbled on a Facebook WordPress group. Someone was asking why his site is slow. There were many members responding. Someone said that he is using too many pictures, someone was replying that his web host is slow and should switch to a better one. One person even replied that he should change the theme. But they all failed to check his website performance. You can use services like Pigdom or GTmetrix to see what is slowing site easily. Upon a first run I noticed that his website is 8MB in size. It’s true that his site was a photography site with many pictures, but I still find that people are unaware that image optimization is necessary for a fast website. He could easily reduce size of the website for 6 MB if he used an image optimization service. I tried several image optimization services, but none came close to Optimus. Optimus is a product created by the same team that created KEYCDN. KEYCDN is exceptional CDN that matches and even exceeds well known CDN providers. With one difference, their pricing is so affordable that many blogs could use it for less than 1$ per month. KEYCDN is the next project I will take on as soon as I finish OPTIMUS review. Now, before I start with OPTIMUS review, I would like to mention why I am moving away from my favorite image optimization service KRAKEN.IO. You see, Kraken is good, image optimization is great, but the problems are what’s making me move. Sometimes, it won’t optimize featured images 100%. Funny thing is that If I put the same images through their website, they get optimized, so it seems that they have an issue with WordPress plugin. Second problem is image optimization speed when images get uploaded through the WordPress plugin. When you upload 3 Images through Kraken it takes more than 10 seconds to be able to use WordPress. Optimus became my favorite image optimization service mainly because of the speed. Don’t get me wrong. It still optimizes pictures really well, but the speed is astonishing. If I upload 10 pictures, I barely notice any lag. Optimization is almost instant. I don’t know the reason, but If I had to guess, they have servers across the globe. If a picture travels to Kraken server in 5 seconds, it travels to Optimus server in 2 seconds in addition that I upload several as opposed to only one with Kraken. Plus the service I think is optimized better. Optimus has three versions you can choose from. First one is free and is available from the WordPress plugin repository. Unfortunately, for a free version, file size limitation is 100KB. But the good side is that it offers UNLIMITED amount of images you can optimize. That means that if you can resize the images before you upload them to your site, chances are pretty good that you can fit all of them to the plan. Then next plan is called Optimus HQ. For 29$ per year, you get maximum upload size of 5MB per picture which is enough for anything related to websites, HTTPS connections for increased security, Conversion to a WebP format which is more efficient and supported on modern browsers and a Developer API. This plan is recommended for bloggers or website owners. You can use the license on as many websites you own. Optimus HQ PRO is a plan which has the same features as Optimus HQ plan, only difference being that you can use it on your clients websites as well. So if you have X clients, they can all use the service for a one-time payment of 149$ per year. As you can see, the price is pretty awesome. Minimum plan for Kraken is 5$. 5$ x 12 = 60$. Optimus HQ is 29$. You will save at least 30$ per year. As soon as you optimize more than 500MB of images per month, savings will be even higher. There are just couple of settings you can turn off. For example, you can choose to turn off removal of EXIF data especially appropriate for photographers, you can also enable WebP files in addition to regular JPG and PNG formats, you can enable HTTPS connection and you can disable optimization during the upload. If you never used image optimization service, you can optimize images in your image library with a Optimus Bulk optimiser. An option that will optimize all the images in the WordPress media library. You can also manually select images in media library. First you select the images, choose optimize images from the menu and click on apply. On the right side you will see image optimization percentage. You know, how well was image optimized. All in all, Optimus rocks. Great WordPress image optimization service. You can save some money and save some time compared to other similar services. It’s almost perfect. I just wish that it had an option for lossy optimization. Currently the only option is lossless optimization. 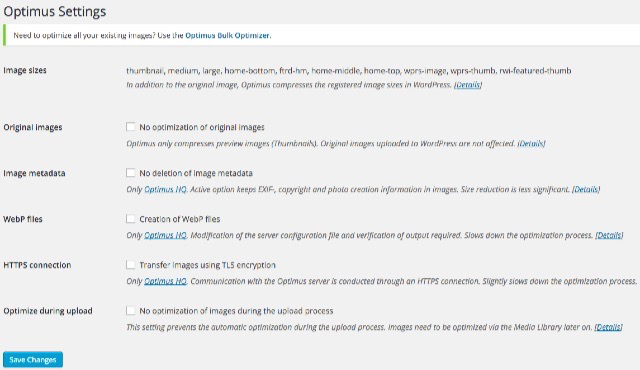 Summary: Optimus is great WordPress image optimzation service. It’s cheap and it super fast.